September, Komo, Piezo, Lehtola, and Eddie. Five boys, from five different families. And one corpse, the body of a classmate’s older sister, found splayed out in the long grass as the boys are skipping classes from school. From that moment on, nothing was ever going to be the same again. Years later, another girl’s body turns up. This time, among the first on the scene of the crime is Chief Inspector Eskelinen. Eskelinen is tasked with determining whether the case might have some links with earlier killings. In going through old investigation material, he comes across the name September, and also the fact that some on the side of the law are willing to do absolutely anything to ensure that murders go unsolved. What September Saw is a coming of age, love and detective story inhabiting the genre of crime fiction. 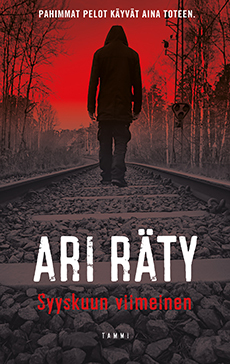 Ari Räty’s next crime novel Shadowman continues the stroy of What September Saw in the same somber tones, telling of anger and despair, as well as failure, but there is also room for beauty and love. And hope. Shadowman is due out in March 2018. What September Saw was nominated for the Best Debut of the Year Prize, the first crime novel in the award’s history to be so recognized.